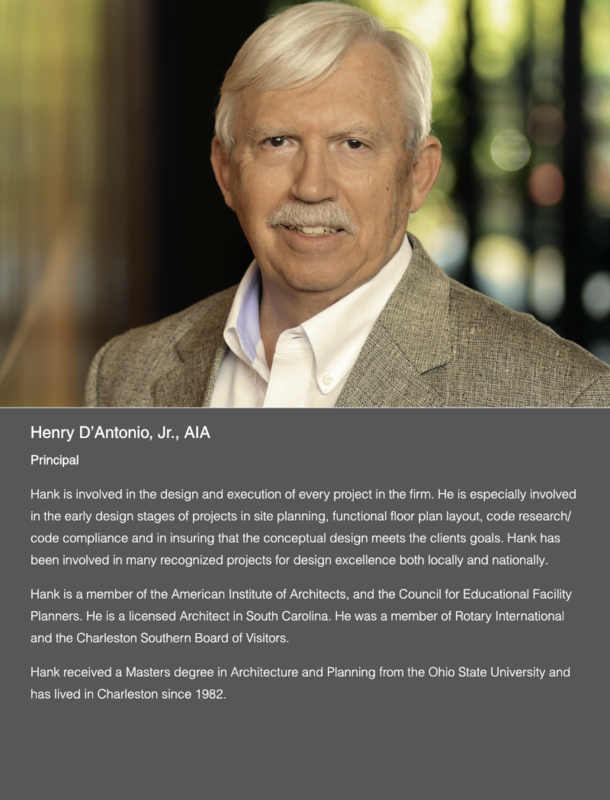 The firm principals, Garey Goff and Hank D’Antonio, have worked together since 1988, first as the Principals of the South Carolina office of NBBJ, and then as Goff D’Antonio Associates since 1991. 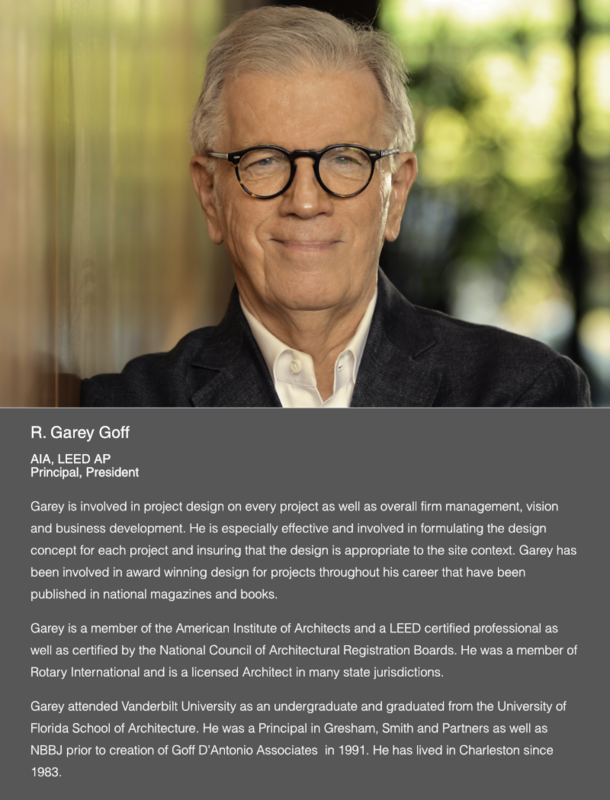 The firm was created to continue the tradition of providing outstanding service, while emphasizing excellent design and sustainability, to create a valuable and lasting product for our clients and society. Our goal is to accomplish our clients goals, to enhance their business performance, and to exceed their expectations. 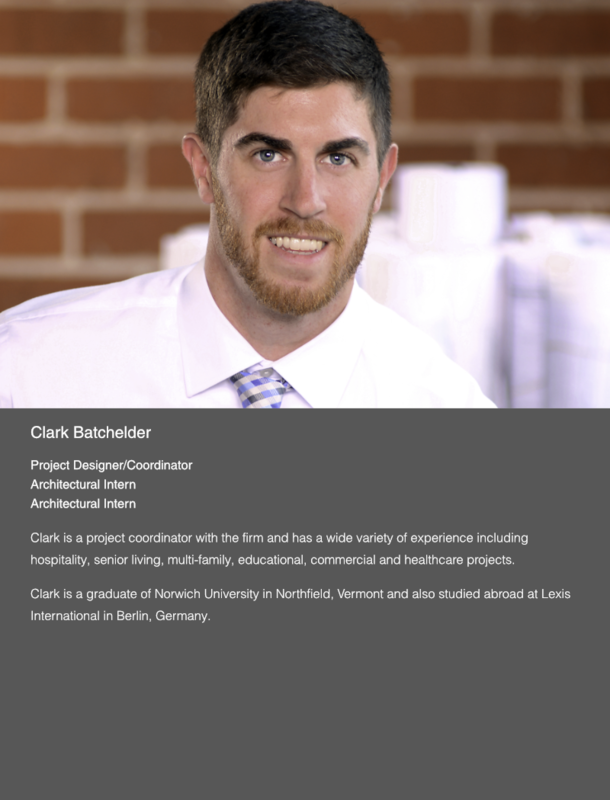 We value teamwork, responsive service, and enhanced communication to create outstanding design. Our priority always is to listen and respond to our clients needs. We work very hard to fully understand project requirements and design to meet those goals. 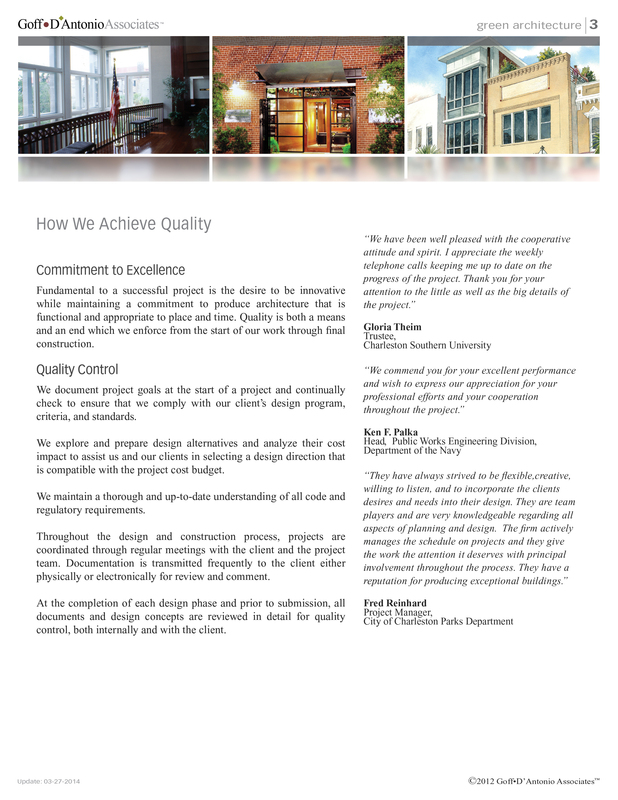 Through this process, we create spaces that work and which create value for our clients. We are totally involved in a project through every phase until completion as well as post occupancy and building management services. 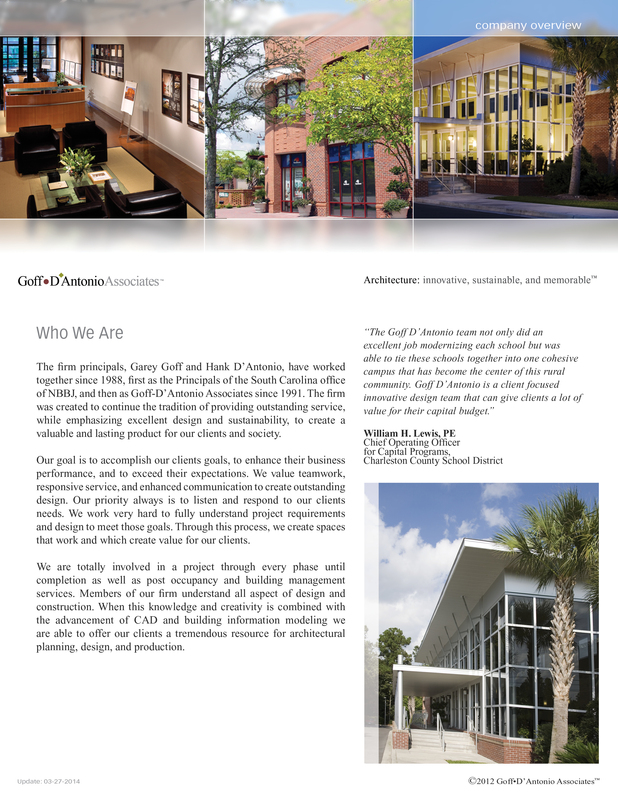 Members of our firm understand all aspect of design and construction. 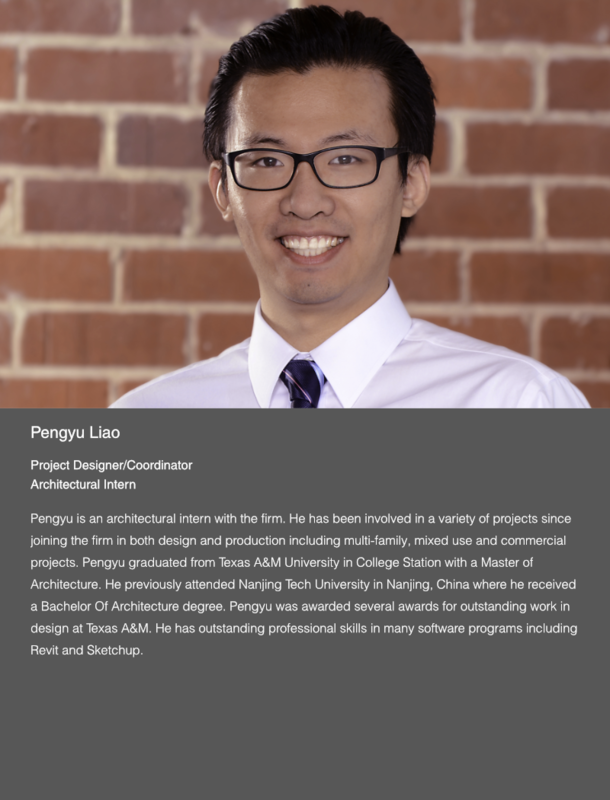 When this knowledge and creativity is combined with the advancement of Revit BIM and building information modeling we are able to offer our clients a tremendous resource for architectural planning, design, and production. We believe that outstanding architectural design achieves a balance between aesthetics, economy, and function. Excellent design balances and blends timelessness with sensitivity to place. We believe in design which is energy efficient, sustainable and environmentally sensitive. Functional design requires respect for user needs and an understanding of their operations and goals. The user must be involved in defining needs, and dialogue between user and designer must be ongoing. Our goal is to create spaces and environments which enhance our clients lives and their users’ performance. To achieve value requires an understanding of costs, materials, and systems, and their appropriate uses. Partnering and collaboration with our consultants and contractors ensures the continuous involvement of cost and delivery specialists in the design process. To attain high aesthetic standards requires a sensitivity to the project location as well as an understanding of space, form, scale, and proportion. We have proven our ability to achieve high aesthetic standards by the quality of our built work. We provide complete planning, architectural, and interior design services for a wide range of projects. Our firm is organized to deliver outstanding client service so as to create excellent architectural design. Our approach is highly interactive. Our clients, our staff, and our consultants work together to identify and address needs, generate options, and determine project direction. To help us explore a building design from the inside and outside, we use both old and new technology, hand sketches and Revit BIM to create options and study the effect of design decisions quickly. The use of Revit BIM allows us to model the building design in 3D and view this design from all vantage points. Our approach is a focused, collaborative process that emphasizes dialogue between all participants. Solving problems, developing consensus, evaluating alternatives, and reviewing project phases are all part of this process. 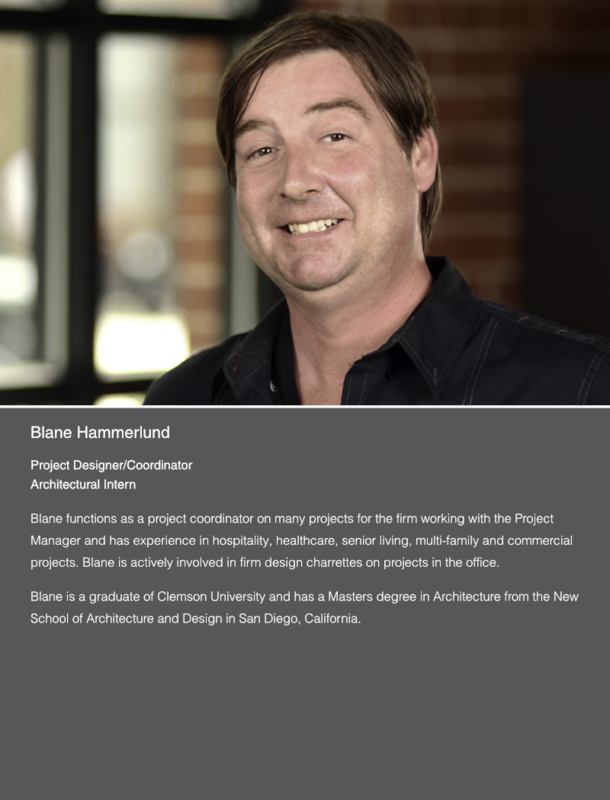 Our team approach ensures quality design that balances aesthetics, economy, and function. We believe that listening is the key to good planning. We use meetings and interactive planning sessions to gather information and build consensus. Our planning recommendations are achievable goals based on a client’s specific and unique needs. We work with you in ways that have been successful throughout our firm’s history. 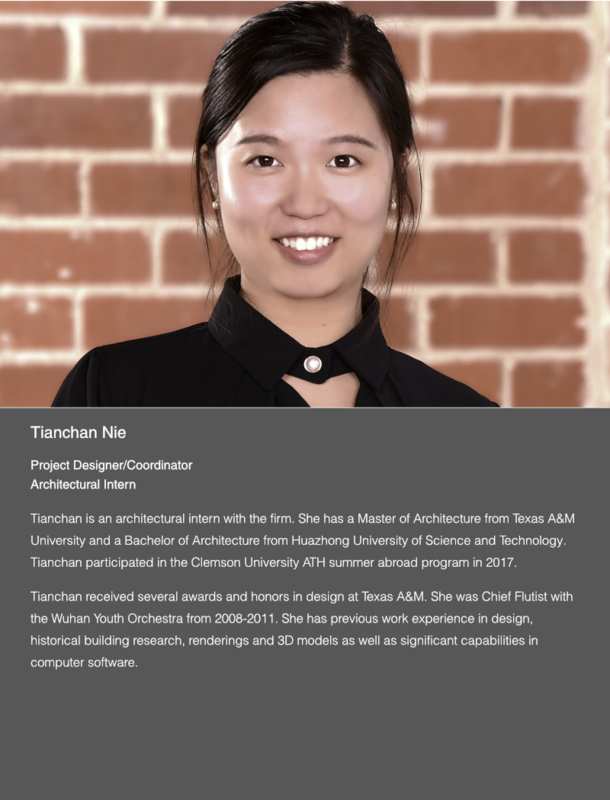 Our approach is organized to create a thoughtful, focused process based on a thorough understanding of user needs, the site and its context, and sound planning and design principles. Fundamental to a successful project is the desire to be innovative while maintaining a commitment to produce architecture that is functional and appropriate to place and time. Quality is both a means and an end which we enforce from the start of our work through final construction. We document project goals at the start of a project and continually check to ensure that we comply with our client’s design program, criteria, and standards. We explore and prepare design alternatives and analyze their cost impact to assist us and our clients in selecting a design direction that is compatible with the project cost budget. We maintain a thorough and up-to-date understanding of all code and regulatory requirements. Throughout the design and construction process, projects are coordinated through regular meetings with the client and the project team. Documentation is transmitted frequently to the client either physically or electronically for review and comment. At the completion of each design phase and prior to submission, all documents and design concepts are reviewed in detail for quality control, both internally and with the client. Our working environment is an open contemporary office space in a renovated historic warehouse in the upper King Street Design District. Our studio space, meeting rooms and resource areas foster creativity, collaboration and teamwork in a warm atmosphere. Visit the contact page for full contact information. Mason Prep entered the design and construction process looking for new and renovated facilities that would match the quality of the educational program that goes on inside our school. Goff D'Antonio Associates' designs have done that and more! The GDA team took the time to carefully consider our program needs and developed plans that will allow us to meet those needs within our challenging space constraints. 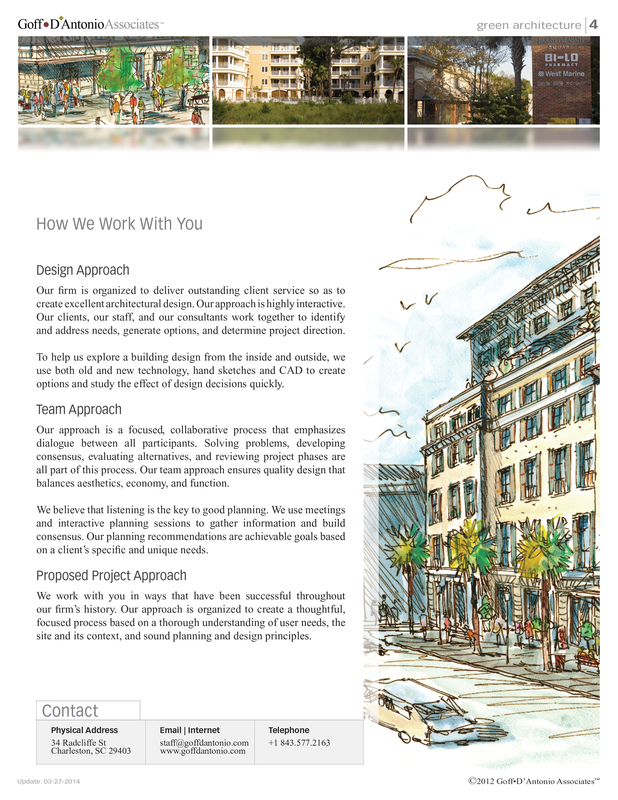 The designs look beautiful and very appropriate both for school buildings and for our location in downtown Charleston. We can't wait until our first new building is ready for our students! Many of my patients have complimented me on this beautiful facility and they enjoy coming here. The Facility has been a great success, met our budgetary goals, and was completed in the time frame anticipated. Goff D’Antonio was able to sheperd the design through the process and create a truly outstanding building on time and on budget. 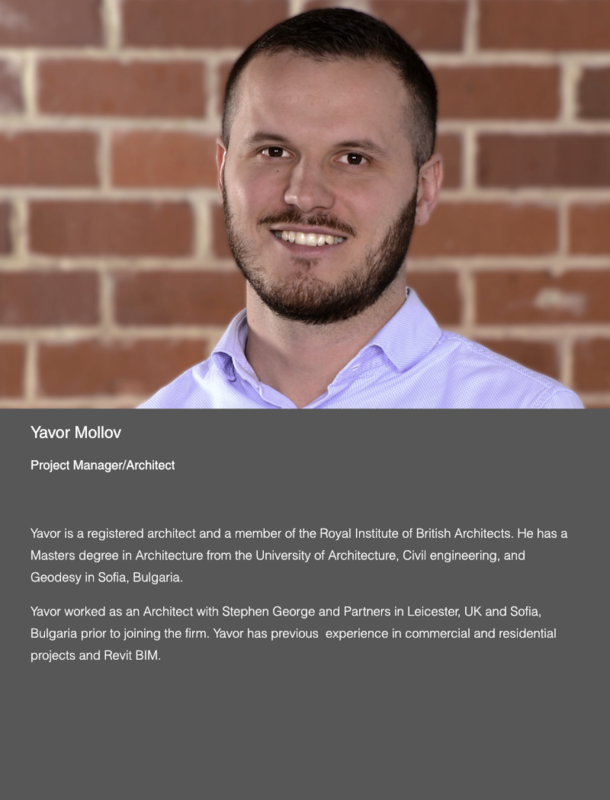 I have received many compliments praising the unique design.....I would consider every project that the firm has completed for us to be a success. The Goff D’Antonio team not only did an excellent job modernizing each school but was able to tie these schools together into one cohesive campus that has become the center of this rural community. 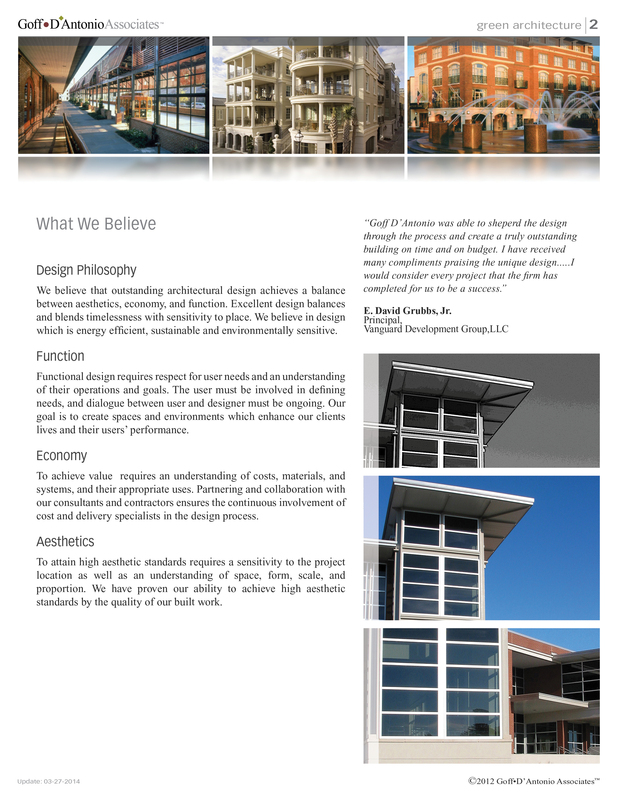 Goff D’Antonio is a client focused innovative design team that can give clients a lot of value for their capital budget.